Plug-in cars — which are touted as green because they use little if any gasoline and can reduce greenhouse gas emissions by between 49 percent and 75 percent compared with a conventional vehicle — will soon be a viable option in Texas. By the end of this year, Austinites should be able to buy the new electric car from Chevrolet, called the Volt. By next February, hundreds of Leafs, Nissan's plug-in car, will be on the roads around Houston. The new influx, fueled by government subsidies, should more than double the number of plug-in vehicles in the state. 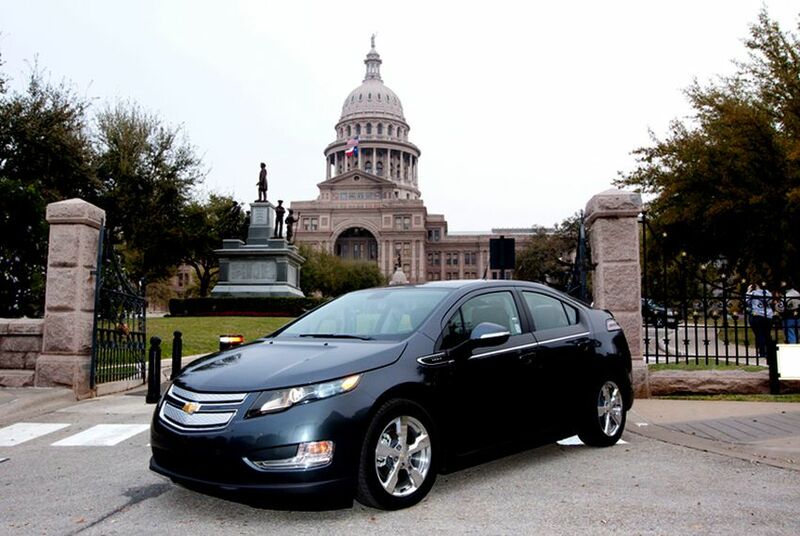 By the end of this year, Austinites should be able to buy the new electric car from Chevrolet, called the Volt. By next February, hundreds of Leafs, Nissan's plug-in car, will be on the roads around Houston, which also announced on Thursday that it would allow purchasers of the Volt to charge their cars for free. Already, at least 30 Texans own Teslas, a high-end plug-in roadster. The numbers aren't exactly earth-shattering — there are 21 million-plus cars on Texas roads. But the new influx should more than double the number of plug-in vehicles in the state, estimated to be in the low hundreds by a representative for the electric vehicle consortium Plug-in Texas. "Austin is one of America's greenest cities," said Edward Whitacre, Jr., GM's chief executive, as he announced earlier this month that Texas — starting with Austin — will be among the Volt's first seven markets. (Whitacre, the former chairman and CEO of San Antonio-based SBC, is a Texas Tech University graduate who was born in Ennis.) GM also has more dealerships in Texas than in any other state. It does not yet know how many Volts will be shipped to Austin dealers, but the initial delivery will likely number in the low hundreds. The vehicles are touted as green because they use little if any gasoline. A 2010 U.S. Department of Transportation analysis found that plug-in hybrid electrics like the Volt can reduce greenhouse gas emissions by between 49 percent and 75 percent compared with a conventional vehicle — including the emissions created by plants generating the electricity the cars use. The Volt allows customers to go 40 miles on a charge, after which a gasoline engine kicks in, giving the car a 340-mile range. The project represents stark departure for the embattled GM — creator of the gas-guzzling Suburban, the national car of Texas — and a large bet that consumers will fork over an estimated $35,000 to $40,000 in a segment where long-term reliability and resale remain uncertain. The Nissan Leaf, a smaller car, costs nearly $33,000. The Tesla Roadster, which rips through 0-60 in about four seconds and has become the favored celebrity toy, costs upwards of $100,000. A state program called the Texas Emissions Reduction Plan subsidizes companies with fleet vehicles, such as buses or taxis, to replace old, dirty vehicles with alternative-fuel vehicles, including plug-ins. But the program, which pays up to 80 percent of the cost of replacement vehicles, has yet to finance any electric vehicles, according to Terry Clawson, a spokesman for the Environmental Commission on Environmental Quality, which runs TERP. The program has, however, financed "quite a few" electric forklifts, he said. Another TCEQ program, called Clean Fleet, is considering its first round of applications and has received one application for three electric vehicles from the city of Austin. For individuals, the state has done little to encourage electric cars. In his State of the State speech last year, Gov. Rick Perry voiced support for a $5,000 incentive for Texans buying plug-ins in "non-attainment areas," an Environmental Protection Agency designation meaning the areas failed to meet clean-air standards. Houston, Dallas, Fort-Worth and the Beaumont-Port Arthur area make that list. A state Senate bill last year offered a $4,000 subsidy, but it failed to pass, and its sponsor, Sen. Kip Averitt, R-Waco, has since retired. California — home to more than 1,500 electric vehicles, including 500 Teslas, according to a California electric-car group — gives buyers a tax credit of up to $5,000. Some local governments in Texas, however, have signed on enthusiastically. Houston’s city government has ordered 100 Nissan Leaf vehicles and already has installed 10 city charging stations, one at city hall. It plans to use federal grant money to install 15 more stations. "If people see these electric cars can work in Houston — which has been seen as the oil and gas capital of the nation if not the world — I think other cities will see they can do this too," said Laura Spanjian, Houston's sustainability director. Austin Energy offers a modest incentive for plug-ins. The utility also anticipates acquiring a few Volts for itself, along with about a dozen plug-in Dodge Ram pick-ups next year. It is also converting 20 or more of its Priuses to be plug-ins, according to Karl Rábago, the utility's vice president of distributed energy services, and plans to put in a number of charging stations around Austin; these might also be available for electric bikes and scooters, he said. The federal government offers a hefty tax credit worth up to $7,500 for purchasers of electric vehicles and pumps out additional subsidies to encourage their use. Jenny Danieau, the senior transportation planner at the North Central Texas Council of Governments, says that so far her group has received $13.1 million from the Department of Energy for alternative-fuel vehicles, including electrics. Projects receiving money include two electric recharging stations in Dallas, one at Frito-Lay, the other at Dallas-based Canteen Vending. Federal money channeled through the state energy office had added another $2.5 million, and her group is also applying for still more funding for alternative-fuel vehicles through the Environmental Protection Agency. Texas utilities, which sense an exciting new market for electricity, are preparing for the arrival of more electric cars. NRG, which owns the retail electricity business of Reliant Energy in Houston, plans to add 40 to 50 rapid-charging stations around the city. They will be positioned so that anyone driving on Interstate 10 in the city will never be more than five miles from a charging station, according to Mike Harrigan, the general manager of the company's energy electric-vehicle services. These rapid-charge stations would bring a Nissan Leaf car to 80 percent in 25 minutes, though they may be better suited to even shorter "top-ups." NRG has sought partnerships with such retailers as Starbucks so that drivers can get a latte while the car charges. Other stations, to be placed in offices, would take hours to charge. The fast-charging stations can cost up to $50,000 to put in place, NRG said. The slower-charging ones would be nearer $5,000. But NRG anticipates that 80 percent of charging will be done at home, at night. That’s when the wind blows hardest in Texas, creating a good use of the renewable power, though utilities will need to make certain that everyone doesn't start charging all at once, at 6 p.m., when they come home from work. Home charging stations may typically cost up to $2,000, according to Harrigan — with the exact figure depending on technical issues such as whether you have space on your electric panel for an extra circuit-breaker. NRG will offer customers a payment package that would include installation of a home charging station and electricity for charging at home and in the city. Over the long term, Texas' electric car boosters hope that the state and cities will pile on more incentives for the vehicles. They dream of close-in or discounted airport parking, reduced tolls, tax credits and even HOV lanes open to solo-driven plug-ins (California just ousted the Toyota Prius gas-electric hybrid from the HOV lanes but will keep them open for electrics). "We're going to keep working as hard as we can,” said Spanjian, “to show people we really want these cars."